When you’re travelling, there’s always a need for the familiar, no matter how far from home you are. One of those welcoming places that is seemingly found everywhere, is the sports bar. The place for those to gather to watch their favourite team take on the enemy and regale each other with stories of past games. Its the perfect spot to relax as long as you want, meet people or just hang out and people-watch. What always fascinates me is the decor of the sports bar – and in the US its unique in its decoration. There are those bars who purchase signs and pop culture ephemera to decorate the space – transforming something new into something perceived as vintage. But there are those old bars, which have done their decor without plan, reflecting the changing times of year, the patrons of the establishment and years of existence. Visiting the Stop Inn Tavern at Siebkens Resort in Elkhart Lake, Wisconsin, I knew this place was the real deal. Signs and stickers decorated the simple wood interior, which proudly competed for a patron’s gaze. And reflecting one of the most popular obsessions of the area, the tavern was a homage to car racing, which has been intrinsic to this area of Wisconsin since the 1950s. 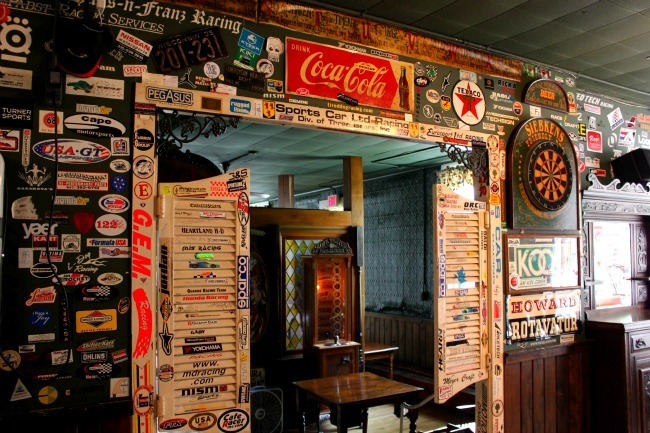 The storied names and companies of car racing can be found on the Stop Inn Tavern walls – its a visual history for anyone who wants to learn about the sport. Its a relaxing spot for a cold drink, and a place that no matter where you’re from, will be happy to welcome you in to become a local.